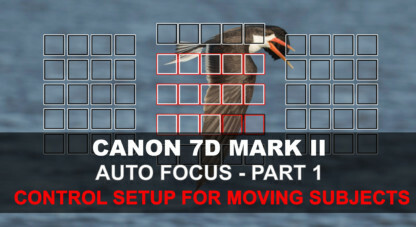 Canon’s 7D mk2 has a powerful and accurate autofocus system. The camera also has a full set of controls, which help users make the most of all the autofocus functionality, and this is one of the differentiators between the 7Dmk2 and other Canon cameras lower down in the range like the EOS 80D, 70D and the 760D. For my wildlife photography needs, I set up my own 7Dmk2 autofocus to operate on the shutter release button. Further to this, I take a little time to configure the controls for Ai Servo operation, so that I am able to minimize unnecessary button presses or eliminate extra menu steps, whilst shooting. I also enable direct autofocus point selection via the multi-controller. In this video I will take time to explain how I make these setup changes, and the reason behind my choices. The camera has so many options that for those shooters coming to the AF system for the first time, it can be almost overwhelming. However, working through the autofocus system step by step, with new videos for each aspect, makes it easy to become more confident with setting up the autofocus on your own camera. Keep them coming Grant!! Extremely helpful!! Thank you Grant. I have just bought my 7D mark II and am going to Kruger next week this will help a lot. Thanks for this Grant….look forward to more. How do I get the Focus Point to display in the Viewfinder? In the Pink/Purple AF Menu, which is the second Menu along the top level, just to to the last tab, which is the fifth screen in the AF menu, and starts with Manual AF Pt Selection. Move down to the second menu option “AF Point Display During Focus” and choose from the options. There are five options, from having no point showing at all, along with four other choices. I prefer All (constant) so i can see where available point placement is? Thanks for a very useful video tutorial on options to set up the AF system on this camera. I am a back button focus user myself, but can appreciate the benefit of using the focusing button in default mode with AI Servo as you describe. I wasn’t ware of the AF Off function being used in the way you describe so that’s another option to consider should I need it. What I absolutely love with this camera is the immense array of options for customising the buttons and setting. It does, as someone has already mentioned, take quite a bit of getting used to, but once one becomes familiar with the options it makes the benefits of customising to personal preferences a really useful feature. I have my AF On button set up to focus (as a conventional back button focuser) and the AE Lock Button (*) set up to also back button, but instantly swap to a different AF Case Mode (Mode 5) and at the same time swap to Centre Point AF, surrounded by eight assist points. This means that if I am focusing on something like an animal on the ground, then suddenly become aware of a bird in flight shooting past in the sky, I can just move my thumb to the adjacent button and be set with a completely new set of AF Points and a potentially more suitable Case Mode for a chance of catching that momentary action in the sky. Looking forward to seeing more of your videos Grant – keep up the good work. Thanks for all your help and advice much appreciated. You have a great combination of bodies and lenses for the Kalahari.. I know I’ve said it a million times but you have the ability to explain what seems complicated and overwhelming to me in a way that is easy for me to understand. I am so grateful that I discovered you! Look forward to more video. You have a skill that not all that common. Very useful information as always! Thanks for the explanation Grant…..just loving theses video’s. Well done and thank you very much for your efforts. Are you going to do the 5D Mk3 after these. It will be great to see just what the differences are. Thanks for a great set of tutorials. By following your set up instructions I have at last been able to fathom out the intricate way in which the AF operates. I am sure that my future wildlife images will be much improved. Thank you for taking the time out to produce these videos. Hope you get some great shots with the camera. Glad you are finding the videos useful. I still have more to come on the 7Dmk2, and will also try to produce a similar series for the 5Dmk3. The 7Dmk2 and 5Dmk3 share much of their autofocus system, but the cameras do have different processors, and there are some differences in the way that they behave. Ok…thanx Grant! I will wait till we are done with the 5Diii. Will check if all my study notes are the same.. :-). Thanx for the videos…Will be away next week but will check up here again..
Grant as always very useful and practical info, looking forward to the rest. Top rate information and very useful, as usual Grant. Thank you. Thanks Grant, very useful. I’m keen to try your alternative technique to back button focus. 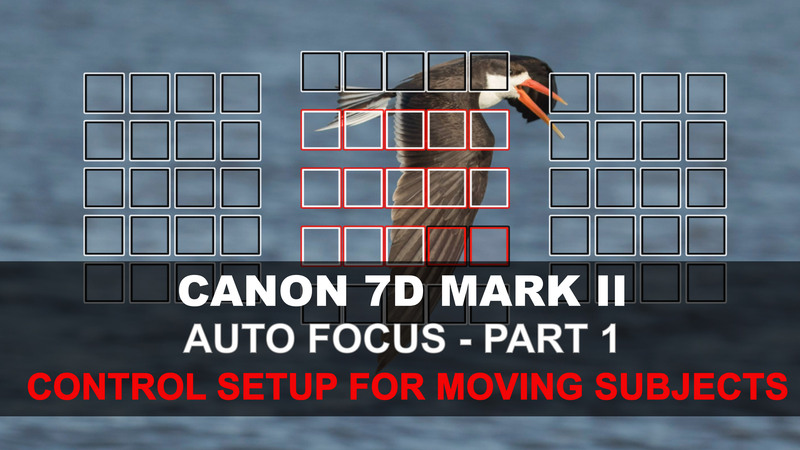 There will be another 7D Mark 2 AF video posted in the coming week :-). Grant – thanks so much for this series of videos. Very helpful.